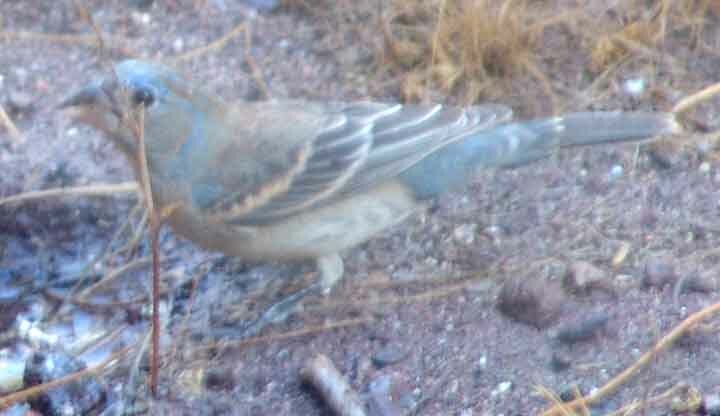 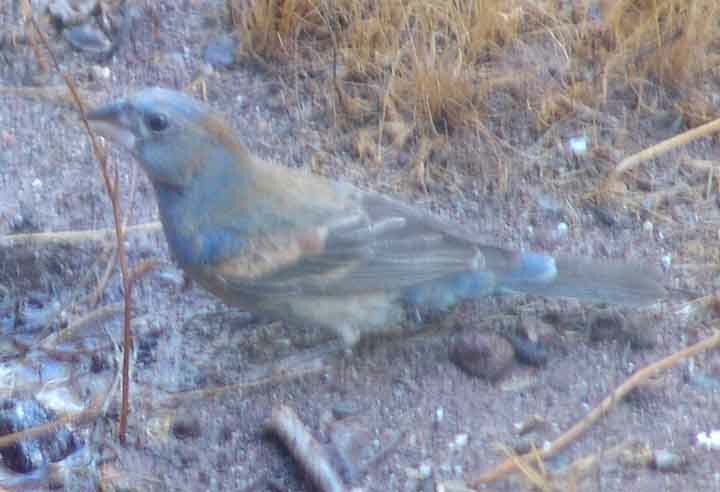 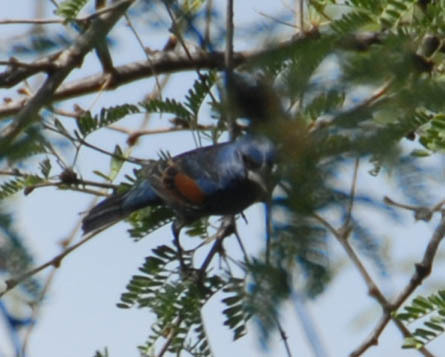 Blue Grosbeaks are found year-round along the Upper San Pedro River, and we see this bird more seasonally in our area, mostly along the River (though Daniel Baker has seen them at the Hot Springs Canyon Windmill). This bird is very similar to the Indigo Bunting, but is larger. 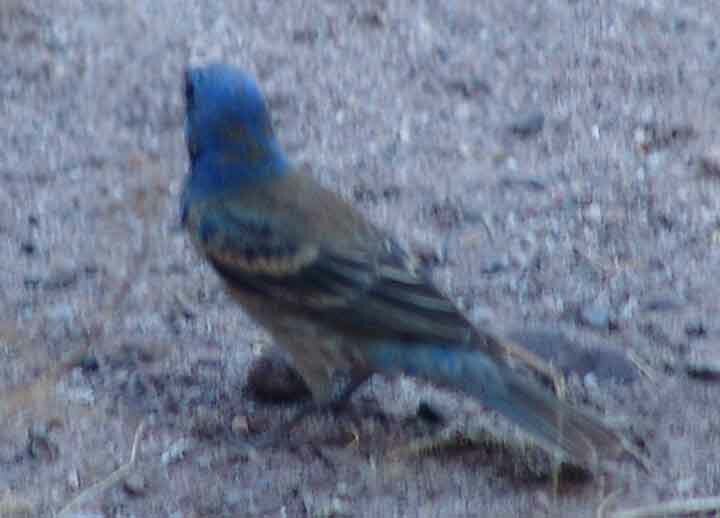 It has a heavy bill and a long, rounded tail. 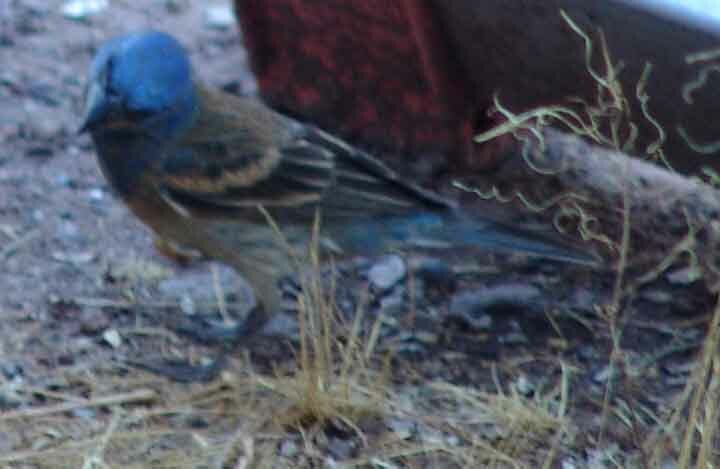 The broad tan wing-bars are characteristic, and color dimorphism is sharp, the female (below left) being a warm brown overall with blue-tinged rump, the male a deep dull blue (below right). This one, below, is darker colored. 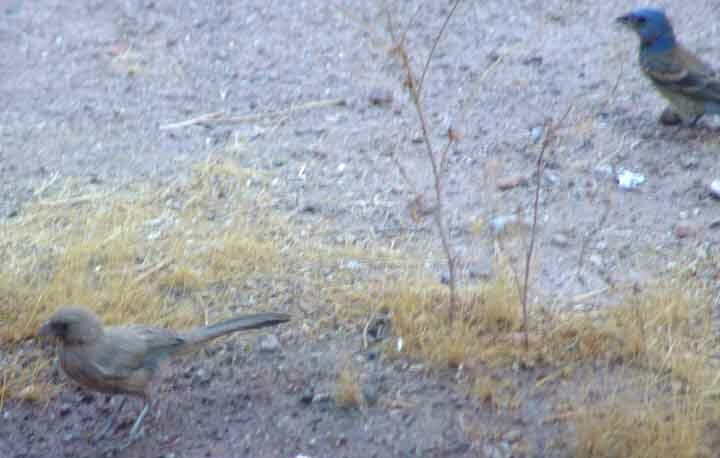 All of these images were taken at the same spot and less than an hour apart. 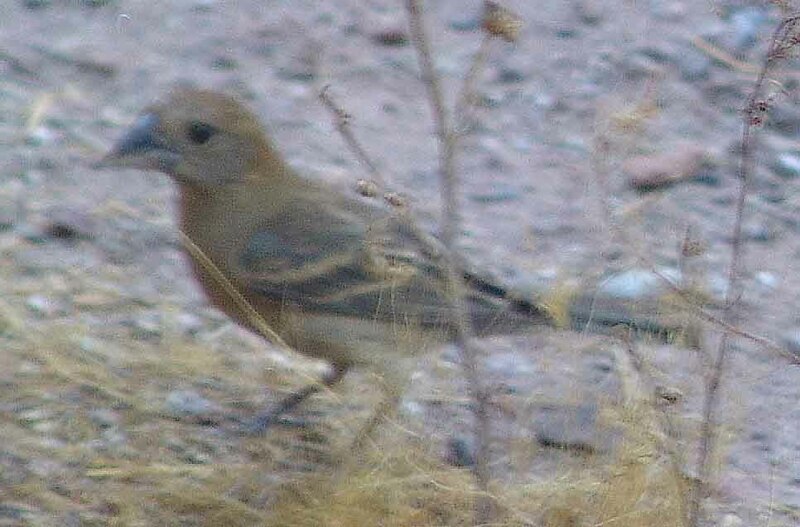 We took the following series of images below of a male/female pair on June 29, 2008, at the Clayworks near Teran Wash. These were taken at greater distance but the day was brighter and the colors clearer. 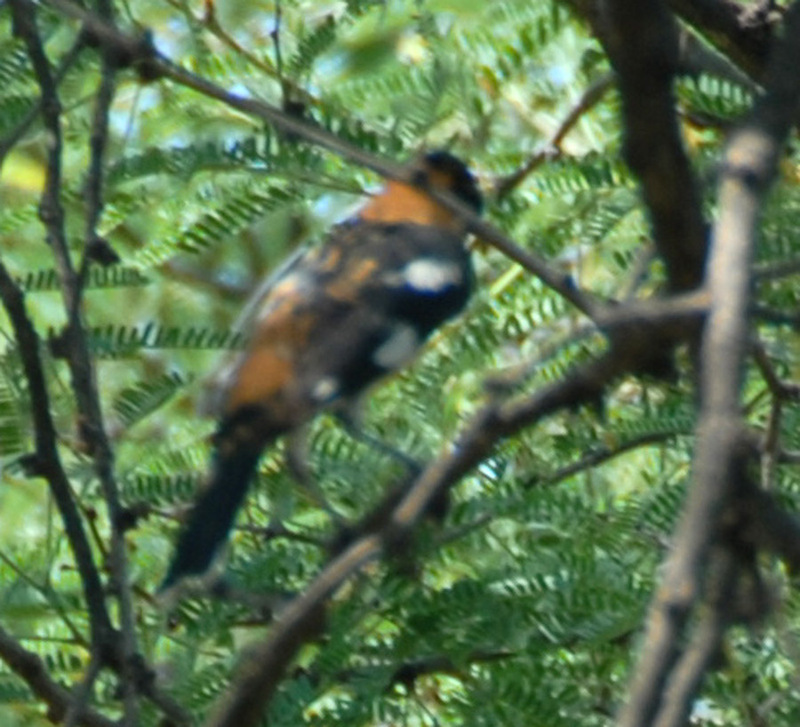 The view of the male bird at left is clear, showing the rufous wing bars and blue body. 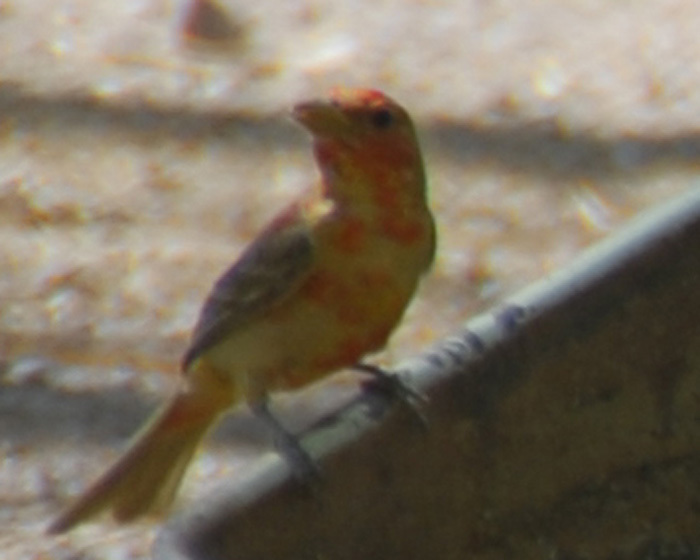 The one at right is blurry but the rufous wing bars still show nicely. 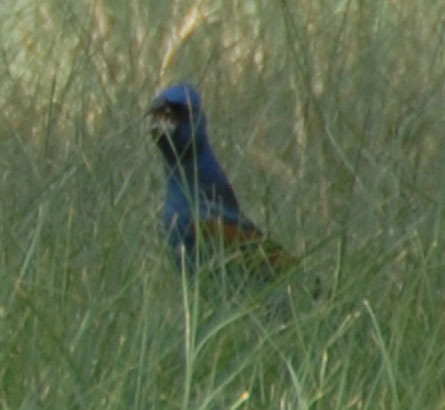 Note also how the bird has extended its neck in order to see in the high grass. Below, the warm rufous-brown colors of the female show well here, as does the heavy bill (in the left-hand image). 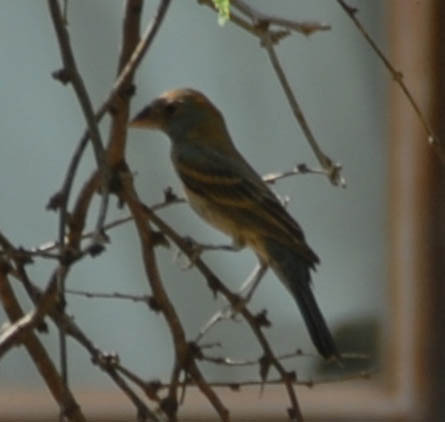 The median coverts on the female are a lighter buffy-brown than what you see on the male. 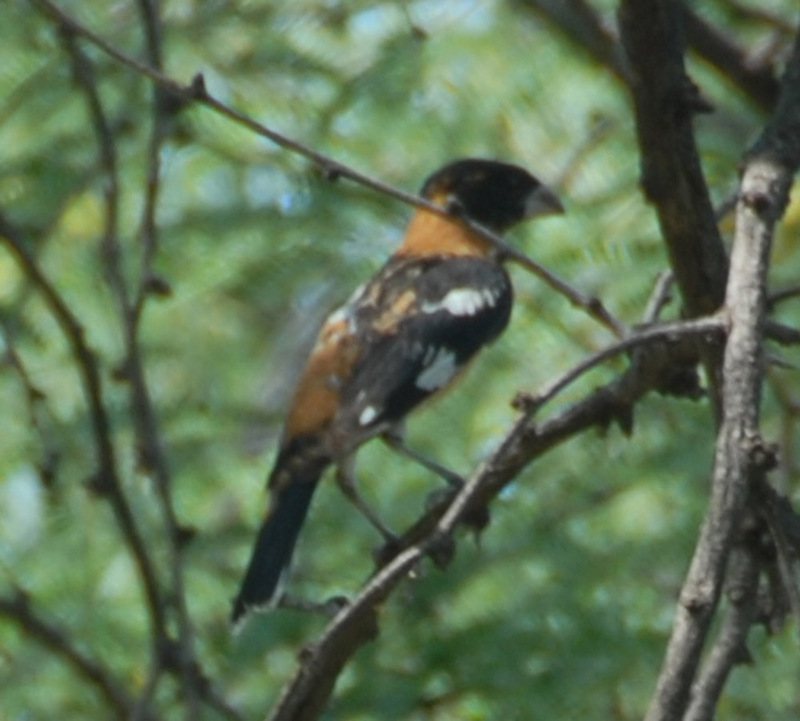 A shy bird, Pyrrhuloxias are widespread on our lands, but despite seeing them fairly close-up for moments, we have obtained few photographs of them. 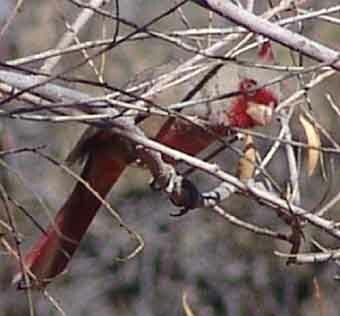 In January 2006, we found this one below, a male, perching above Jim's Willow Spring in Sierra Blanca Canyon Wash. 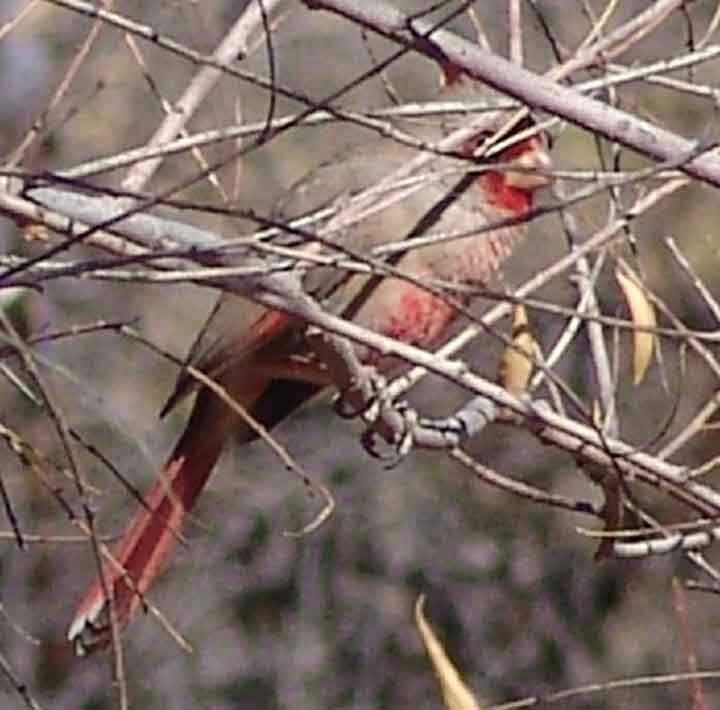 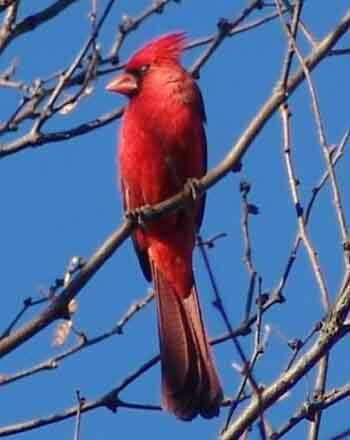 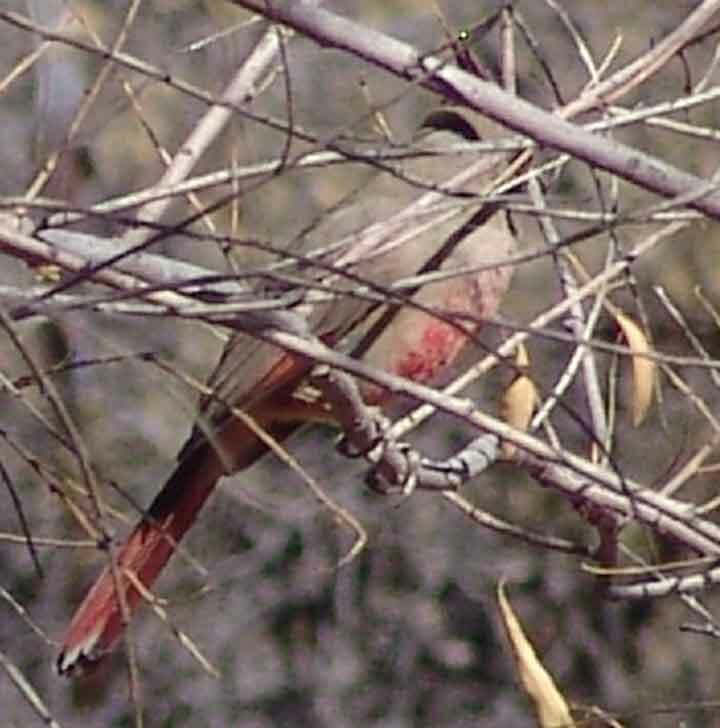 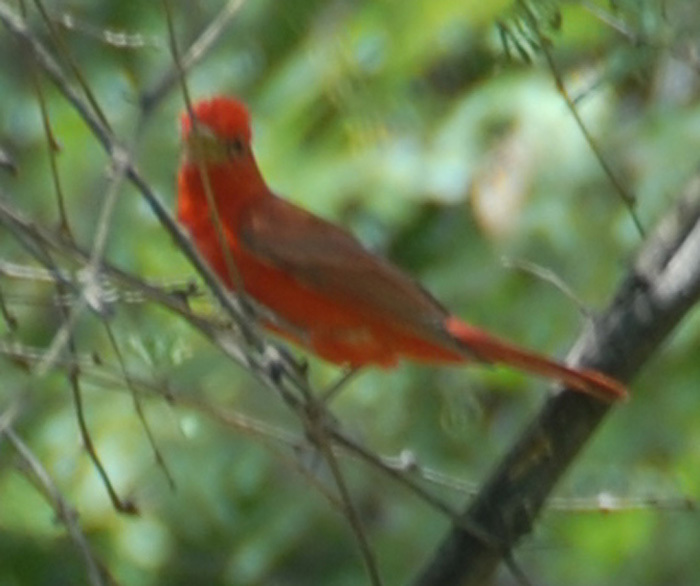 Though each of the pictures is partly obscured by branches, all four together provide a good view of this bird's major distinguishing features (that contrast it with the Northern Cardinal). First, note the predominantly gray color of the body, with a rose-red color limited to face, central underparts, wings, and tail. 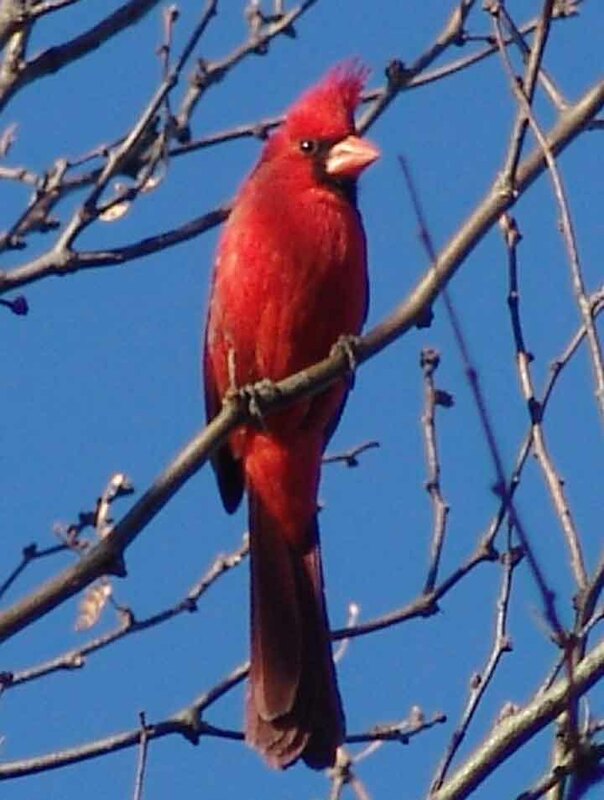 In the two top images you can see that the eye has a yellow ring (lacking in the black eye of the Cardinal) and that the beak is stubby and yellowish (contrasting with the Cardinal's more pointed and orange beak). 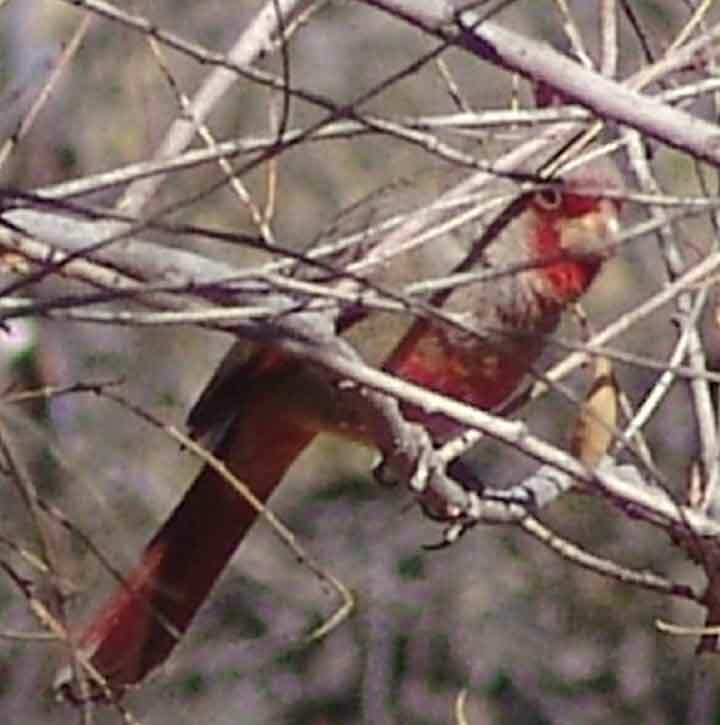 In these images you can also make out that the Pyrrhuloxia's red crest is narrower and more up-pointed than that of the Cardinal. 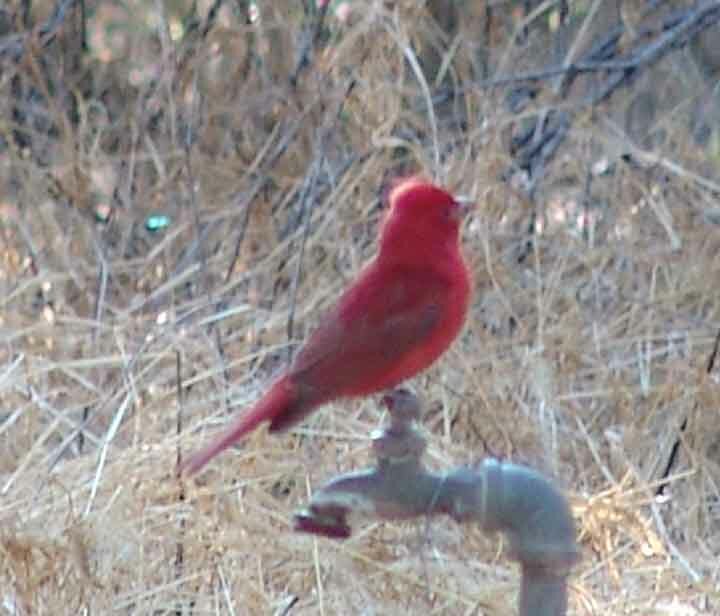 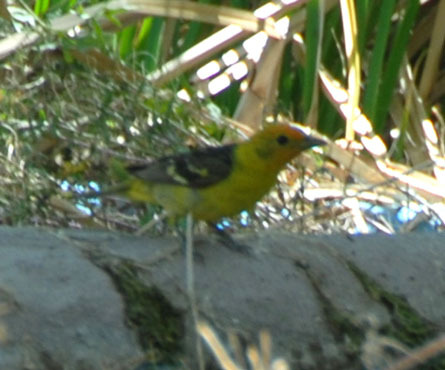 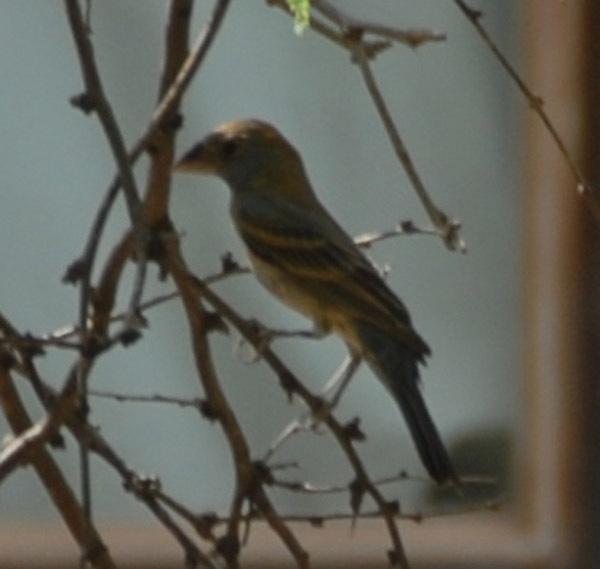 This bird was photographed on the San Pedro River terrace near Teran Wash in May 2006. 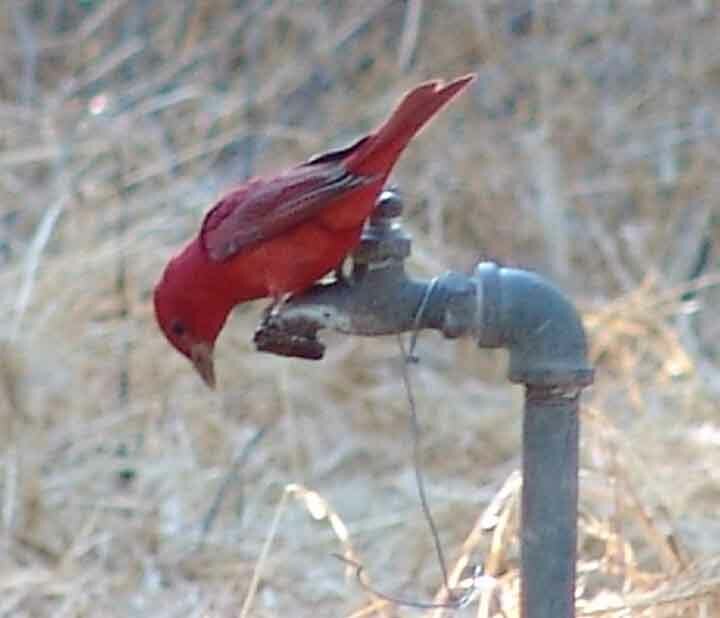 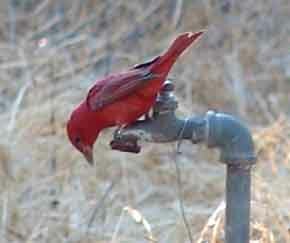 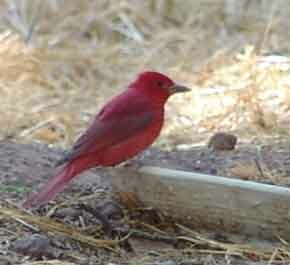 Its duskier wings and back and dark bill distinguish it from the Summer Tanager. 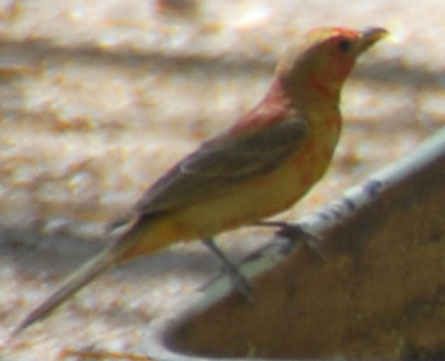 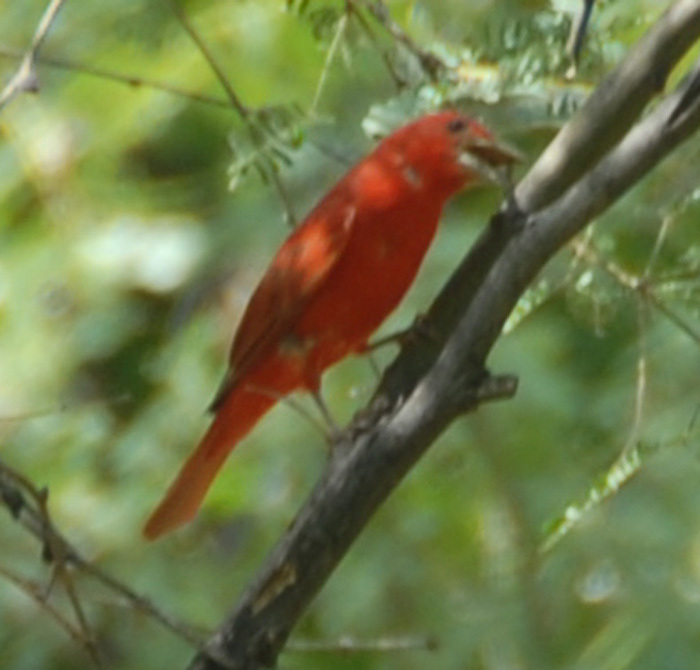 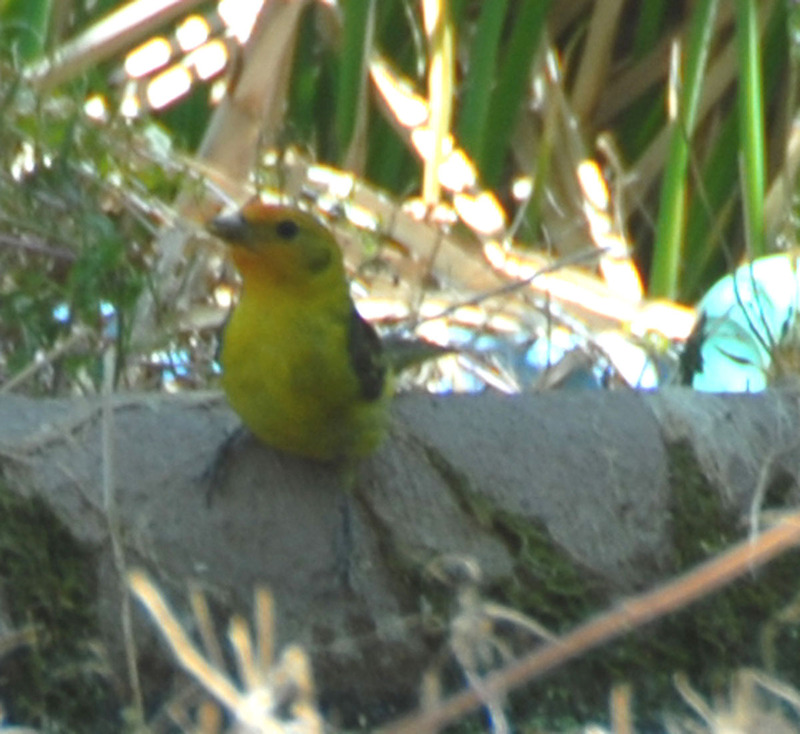 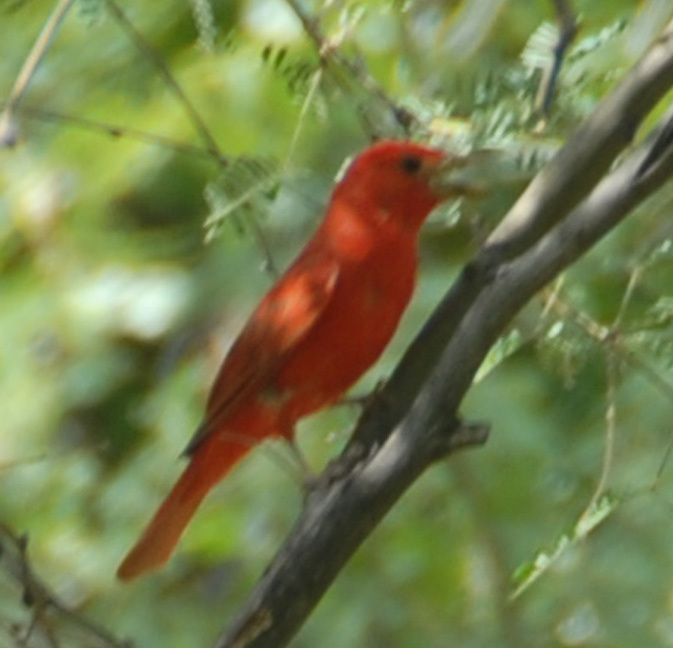 These male Summer Tanagers below were observed on June 29, 2008 at the Clayworks on the San Pedro River. The overall quality of bright rosy color is distinctive. 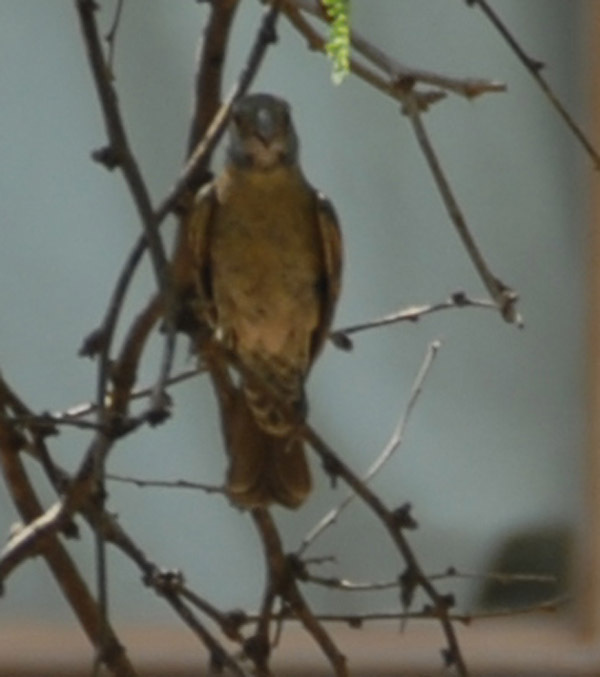 While the bird at left appears to have the darker wing colors of the Hepatic, its crest looks like a Summer. 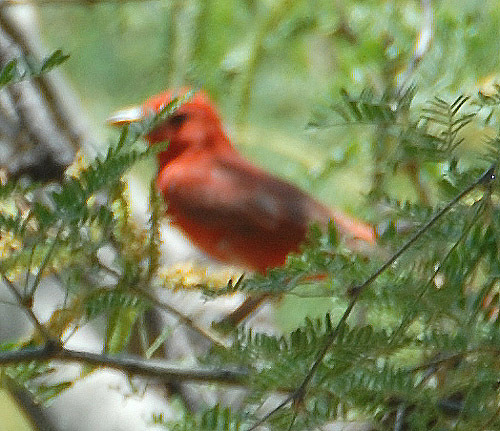 This bird below was seen at great distance on June 28, 2008 at the Clayworks on the San Pedro River. 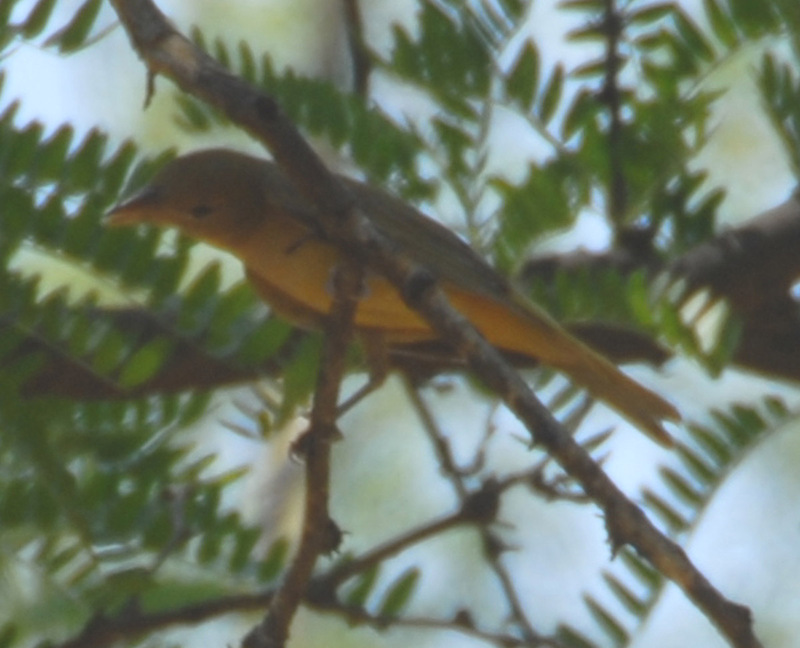 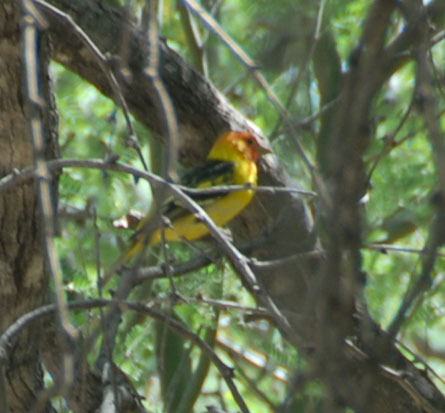 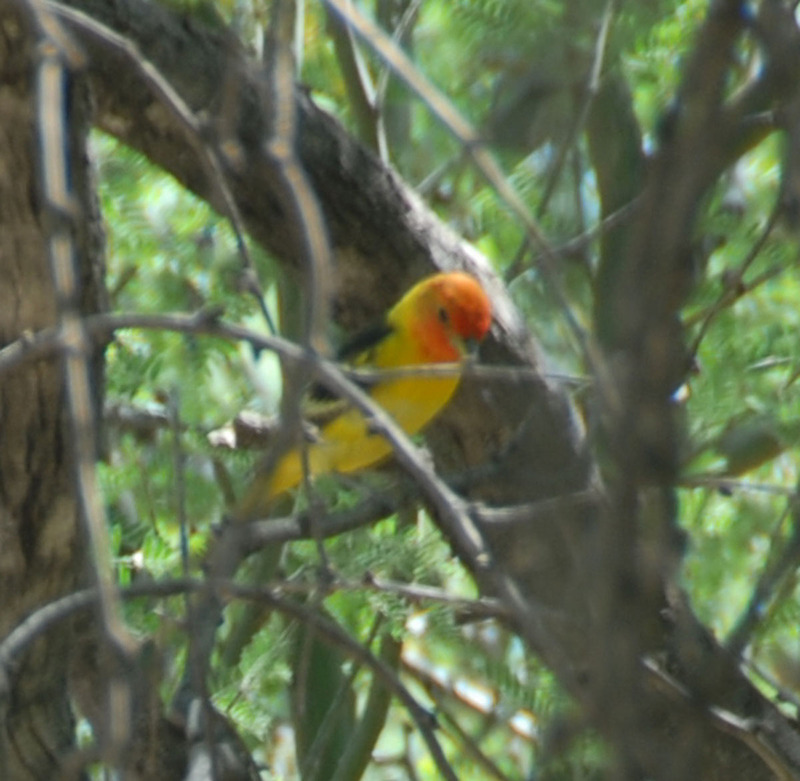 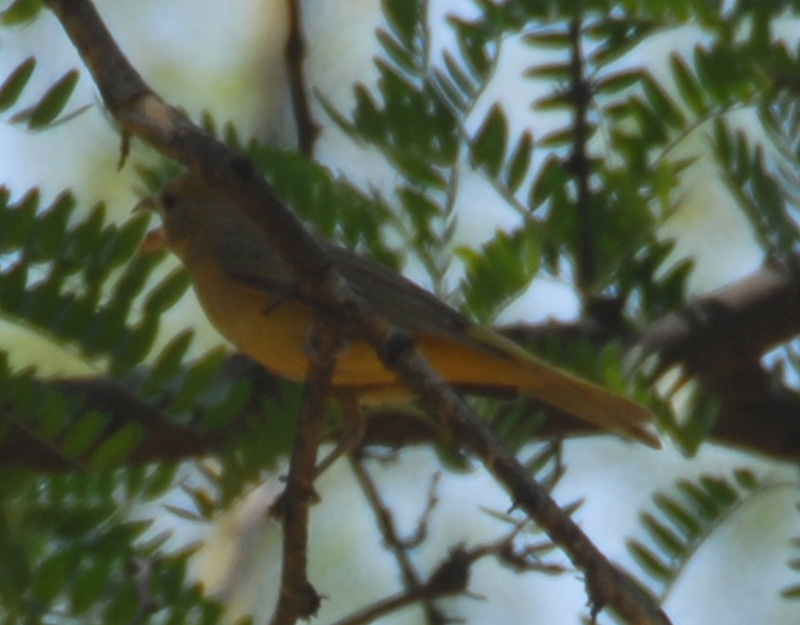 While it is blurred in this image, the pale color of the bill suffices to distinguish it from the Hepatic Tanager.